Nvidia's new-and-improved GeForce Founders Edition has put AIB partners in a quandary. Creating a card that's as sleek as the FE is easier said than done, and justifying a premium for a custom cooler is proving to be a tough nut to crack. What's the answer? Well, on top-end SKUs, Nvidia's partners can take the no-holds-barred approach with premium models that throw caution to the wind. 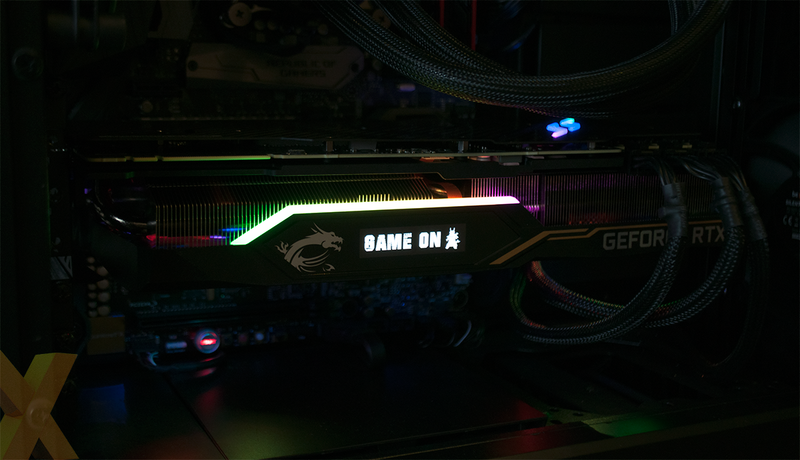 Enter the MSI GeForce RTX 2080 Ti Lightning Z. This is the card for those who care not about cost, and simply want more of everything. While the reference Founders Edition occupies just two slots and measures a mere 267mm in length, MSI's bad boy eats three slots for breakfast and extends to 340mm. It also happens to stand 160mm tall while tipping the scales at just over 1.85kg, but hey, that just means more card for your money, right? And of course, we are talking a fair bit of money. £1,440, to be exact. Sounds ludicrous, but it's actually cheaper than either the Asus ROG Strix OC, EVGA FTW3 Ultra Gaming or Zotac AMP! Extreme. The catch, and it's one worth knowing about, is that the air-cooled Lightning Z is dearer than MSI's own watercool-ready Sea Hawk EK X, available for £1,334. We're of the opinion a heavily-overclocked 2080 Ti would benefit from liquid cooling, but we're intrigued to see how the Lightning Z fares in terms of real-world speeds, temps and noise. We'll get to the all-important benchmarks shortly, but first, let's talk about MSI's new Lightning Z aesthetic. For 2019, it's gold trim, RGB fans and a carbon backplate that not only looks the part but aids cooling and is sturdy enough to provide an impressive level of rigidity. 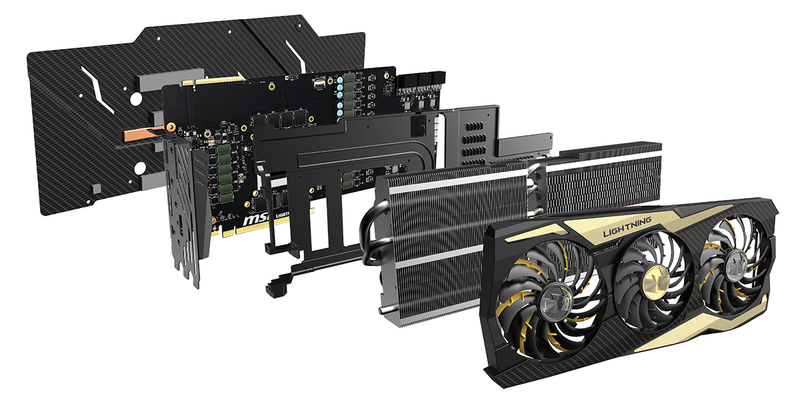 Despite the hefty weight, the card exhibits hardly any sag when installed in our test platform, though if you're worried about the weight, MSI does include a coordinating metal bracket as part of the bundle. The gold highlights are a nice touch, though they don't quite fit in with our test platform, but the jury is out on the RGB fans. MSI has added addressable LEDs to the tips of certain fan blades, resulting in cool effects that vary depending on both setting and fan speed, however there are two immediate drawbacks. Firstly, the central fan isn't illuminated, which looks a little odd, and more importantly, MSI has switched off the ability for the fans to turn off when idle. Why? Because the lights wouldn't look pretty if they happened to be stood still. RGB fans on a graphics card are a bit of a mystery in most systems where you can't actually see them, and as a triple-slot solution, the Lightning Z isn't the easiest to mount vertically. Fortunately, it does look neat when installed horizontally. The RGB-backlit lightning bolts on the backplate are a nice touch, the vivid bar across the top is both bright and vibrant, and then there's the OLED dashboard. This small display reads 'Game On' when temperature is below 60ºC or 'Good Job' when temps climb higher, and can also be used to display live memory usage or GPU frequency when configured via the Dragon Center app. If you prefer, it's even possible to upload your own image or animation. MSI obviously isn't even trying to be as sleek as the Founders Edition. Lightning Z is about as ostentatious as they come, but that's no bad thing for those users who crave maximum overclocking potential and heightened out-the-box frequencies. 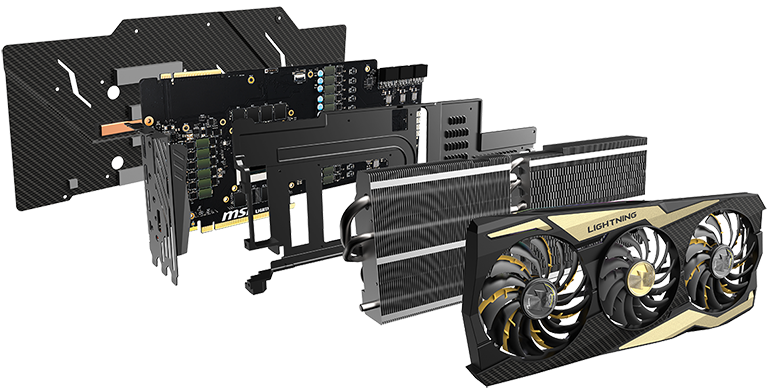 With that in mind, MSI's heatsink is outfitted with eight heatpipes, a heatspreader covers the MOSFETs and vital components, and there's another heatpipe lining the carbon backplate. Not to mention three of the firm's best Torx 3.0 fans. Keeping the goodies coming, MSI's custom PCB sports a trio of eight-pin power connectors, so you're never going to be short on juice, and the 19-phase delivery subsystem is about as impressive as it gets. All this suggests a tasty factory overclock and Lightning Z obliges by shipping with a boost clock of 1,770MHz, representing a near-15 per cent hike on the GPU's default speed of 1,545MHz. The 11GB of GDDR6 memory, however, operates at the standard 14Gbps. The out-the-box speeds are among the highest we've seen, but the idea is for enthusiasts to go further. To that end, there are dedicated voltage-check points for GPU, memory, PLL and 1V8, and though unavailable at the time of writing, MSI tells us its Afterburner overclocking utility will be updated to support overvoltage on all four fronts for maximum wiggle room. There's even a dedicated BIOS to help you tinker. Switch over to the secondary 'LN2' mode and boost clock falls back to 1,545MHz, but the power limit rises to 350W, paving the way for you to experiment. Strangely, a 0dB fan mode is available in the LN2 BIOS. Other than the three-storey configuration, there are no surprises in terms of I/O, with MSI sticking to the default selection of HDMI, USB Type-C and a trio of DisplayPort. It's a monster card alright, let's now run some numbers to see if Lightning Z can leave the Founders Edition trembling in its wake.